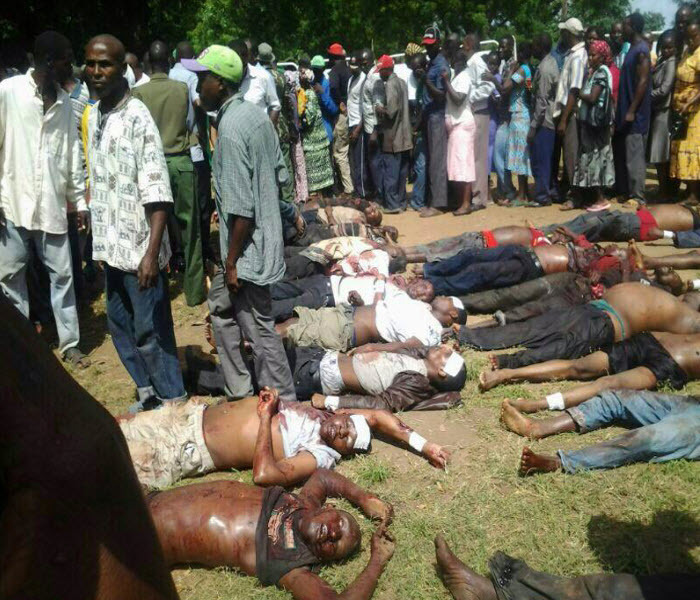 In his today’s address to Kenyans following the Mpeketoni terror attacks, Uhuru Kenyatta claimed that members of a certain ethnic group (read Kikuyus) were the ones profiled and killed by people whom the president alone (in the whole world) believes were not terrorists but killers sent by Raila Odinga! Red Cross has released the names of the dead. KSB: There is a difference between Kikuyu names being present in the list and deliberate ethnic profiling with the sole purpose of killing Kikuyus as the President suggested especially when Raila Odinga is being named as the mastermind without evidence. This is irresponsible. When more than 50 Luos were killed in Naivasha in 2007, Raila did not talk about “ethnic profiling” but associated the deaths to the general 2007 post election violence. Uhuru should have blamed Al Shabaab for the attacks and sacked Gichangi, Kimaiyio and Ole Lenku (top security chiefs) instead of raising tension with empty talk about a non existent ethnic profiling of Kikuyus with Raila as the bandit. That is the point. Liechtenstein will return $227m (167m euros; £133m) to Nigeria that was looted by the former military ruler Sani Abacha in the 1990s, the African nation’s finance ministry says. It was the culmination of a 16-year effort to retrieve the money, it added. To secure it, Nigeria agreed to drop a legal case tied to Abacha’s family. Abacha ruled Nigeria from 1993 until his death in 1998 and is thought to have siphoned billions of dollars into bank accounts across Europe. Transparency International says the dictator stole as much as $5bn during his five-year rule. “We can confirm that Nigeria will on 25 June 2014 receive the sum of euros 167m ($227m) from the government of the principality of Liechtenstein, part of looted funds recovered from the Abacha family,” Nigeria’s finance ministry said in a statement. The recovery of the money had been blocked by legal action brought by companies linked to members of Abacha’s family. The companies’ complaints were withdrawn following negotiations between the governments of Nigeria and Liechtenstein last month. Nigeria says it plans to invest the money in a sovereign wealth fund for the benefit of future generations. Separately, Nigeria agreed on Wednesday to drop charges against Abacha’s son, Mohammed Abacha, who was accused of unlawfully receiving $2.7m of government money from his father. Liechtenstein is not the only European country to recover Nigerian state funds, with Switzerland so far returning some $700m. Earlier this year, the US froze some $458m hidden by Abacha in bank accounts in Jersey and France. Abacha seized power shortly after the 1993 elections were annulled and went on to become one of Nigeria’s most notorious military rulers, accused of stealing billions of dollars from the oil-rich nation.